The Sharper Image Shiatsu Foot Massager is the ideal product for those who are looking for the best way to revitalize their tired and aching feet. A foot massage is one of the best ways to relax and revitalize your whole body. Don’t you just love the feeling that your foot is being massaged? Not only it will improve the condition of your feet, it will also provide a great feeling overall. Shiatsu Foot Massager with Heat uses soothing infra-red heat to warm the feet and increase blood circulation, which is ideal for those individuals who have cold aching feet. The infra-red function automatically shuts off after fifteen minutes of use — you don’t have to bother checking out the equipment if it has turned off. This well-designed foot massager also deeply kneads, soothes and massages the feet. In addition to warming your feet, it stimulates, and relaxes sore muscles in the feet. The sole of the feet have numerous acupressure points, and Sharper Image has found a way to incorporate modern technology with the principles of ancient Asian Shiatsu. The massager gently stimulates these acupressure points on your feet, to give you the ultimate foot relaxation. What makes this product so unique is the six massage roller heads that offers a life-like hands-on massage. 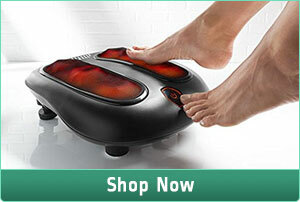 The Sharper Image Shiatsu Foot Massager can massage both feet at the same time and operate with ease. It only takes a touch of the toe to control all functions. Plus, users can use their toe to control the various soothing heat levels — no need to manually operate it! The adjustable legs featured on the Sharper Image Shiatsu allow users to massage their feet on various angles to achieve the optimum foot massage and comfort. To date, there is no other foot massaging product available that delivers this kind of comfort and ultimate deep kneading massaging action. It is the ideal product for those who stand on their feet all day long and for those who are looking for a convenient and effective way to bring comfort back to their sore feet. Many people who have used this product claim that the Sharper Image Shiatsu Foot Massager relived many of their foot ailments and made their feet feel revitalized, invigorated and relaxed. Many users also revealed that this foot massager helped relieve overall stress to their body. The majority of users do not seem to have many negative things to say about this machine, but some say the product is a bit clumsy to handle. Plus, some, particularly the sensitive ones, found it to be a little ticklish to the feet. The Sharper Image Shiatsu Foot Massager is non-skid, durable and is designed to accommodate a wide variety of foot sizes. Plus, it is easy to keep clean and features a convenient cord wrap that stores neatly underneath the machine when not in use. Dimensions: 16.53 x 14.96 x 3.34 inches. The Sharper Image Shiatsu Foot Massager is a very good solution.